Home » What is Zsa.Descriptors? 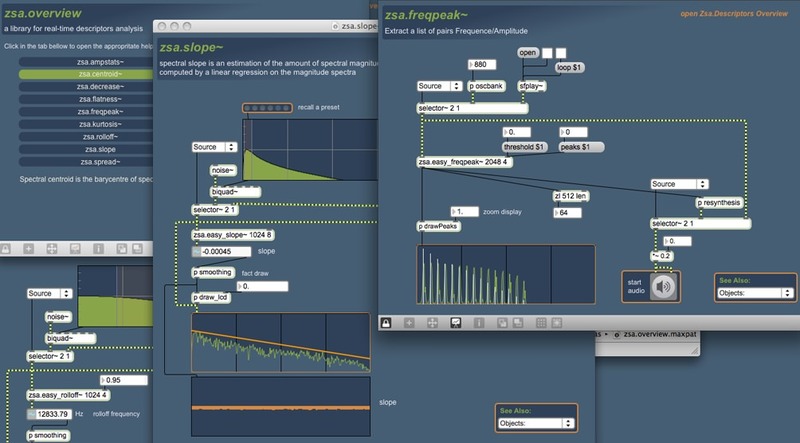 Zsa.descriptors is a library for real-time sound descriptors analysis for Max developed by Mikhail Malt and Emmanuel Jourdan. Hey, Emmanuel, Zsa looks very promising. I downloaded version 1.0rc2, and have some comments. Double clicking on the helpfiles seemed to look for the abstractions, rather than the externals (i.e. zsa.easy_bark rather than zsa.bark~). Substituting zsa.bark for zsa.easy_bark didn’t work. As such, I couldn’t get anything to work. I am very much interested in this package, as I do extensive realtime analysis, and would love to try your take on things! Arne Eigenfeldt (I met you at Cycling’s SF bash April 09). This should probably be clarified somewhere, but basically most of the zsa. *~ works in the spectral domain (within pfft~). In order to make things easier, there’s a 2 stage level of abstraction: zsa.easy_* is the one that you want simply use (it takes the window size, and overlap argument). Zsa.easy_* is an abstraction which will create a pfft~ object with the right window size and overlap that you specified, and load a zsa.abs_* in the pfft~. Zsa.abs_* contains the real zsa.bark~. So the only reason to use zsa.bark~ directly for instance, is if you want to make your own combination of spectral descriptors, or use the result directly within pfft~. This is also a way of optimizing the calculation, as you can see in the zsa.energy~’s help file. Ahh. Got it working now. Looks like I have some fun times ahead, putting these into action! Is there a way to change the distance mode on [zsa.dist] by sending it a message? I want to have the option of going from the default mode to covariance on the fly. Thank you so much for these amazing objects! You can do this by changing the mode attribute: sending the message mode 2 will set the mode to cosine e.g. I have been working with your Zsa.descriptor objects for some time and I believe I have found a possible bug with [zsa.dist]. I have been developing a program similar to Sven Konig’s “ScrambledHackz”. I wanted to add the functionality which would allow for switching between finding the most similar list in [zsa.dist] and the least similar list. In my setup, after [zsa.dist] is loaded with lists, I am streaming lists to compare every 23.22m. As the comparison is happening I send a message (mode 2) to engage the cosine mode. This seems to halt the comparison immediately. To make sure this wasn’t a general problem of changing modes while [zsa.dist] is active I also tried sending ‘mode 3’ (covariance). This works. I do not know if this problem exists on Mac but I will have the opportunity to check next week. (make sure you open the ‘Concat_patch_ej.maxpat’ in the same location as the second patch ‘descriptor_values6.mapat’ or you will get disconnected) patch cables. 3. Double click [p Load_Target_Sounds] and import a .wav file into the first buffer. The sample should play. 4. When the sound is finished playing, exit [p Load_Target_Sounds], back at the main GUI ‘engage comparison’ by ticking the big toggle box and the ‘live’ toggle too. This will make it so that your microphone will drive the concatenation. 5. By default [zsa.dist] is working on ‘mode 0’. To change it to ‘mode 2’ (covariance) tick the first toggle under “Most alike/unlike list:”. You will notice that the comparison stops. 6. If you wish to inspect the mode message being sent double click [p The_Meat] sub patch on the main window. Inside of [p The_Meat] double click [p polyphonic]. In this sub patch, to the right, you will see how the ‘mode 2’ message is being sent. Any help would be appreciated. Your contributions to live sound description have meant a lot to me. It is because of the existence of these objects that I have been able to pursue concatenative synthesis while attending college. p.s. If this post makes it to your website, please do not include the links to the files as they represent unfinished work which I do not yet wish to share with the public. p.p.s I also noticed that getsatisfaction.com/ej does not work. Else I would have posted there. Better yet, here is a version of your zsa.dist.maxhelp with added patching to show you the bug. Way less complicated. Looks like getsatisfaction is working for me. In your example, the inputs values are all the same which seems to cause some problem for the cosine and covariance calculation. I’ll investigate more but it sounds like it’s really sending things properly to the output and the result seems coherent when using more appropriate input. I experienced this malfunction using an appropriate input. The modified help patch I made (as sloppy as it was) was just to give you an idea of the malfunction. It works, at least on my previously listed setup, in the same improper way as the modified help patch. For some reason I have a error extracting files from the zip. I’m using “Unarchiver”. It happens both in zsa.descriptors and ejies. This is really weird. Did you try with the MacOS standard BOM archiver? It looks like it doesn’t work on Leopard. I’ll try to compile that on an other computer. Thanks for your patience. Thanks a lot! Wait for the news …. (I hope soon)…..